Twins! Two osprey eggs hatch overnight! Overnight two osprey eggs hatched at the Osprey Cam nest inside Edwin B. Forsythe NWR in Oceanville on day 40 of incubation. Ospreys exhibit asynchronous hatching or they hatch in the order they are laid. This ensures that the oldest and strongest young survive if there would ever be a shortage of prey. The third egg should hatch within the next 2 days. 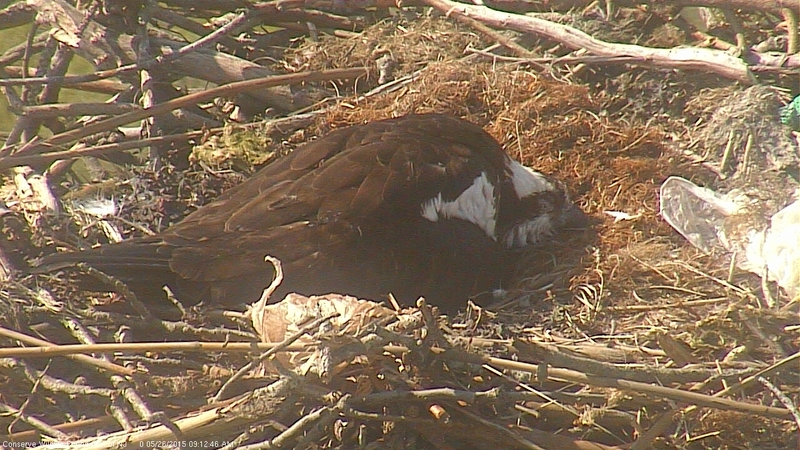 You can tell when osprey eggs hatch by the behavior of the sitting adult. They sit higher, with their wings down and they are a bit more concerned with the young that sit beneath them. Young are born semi-altricial which means that they are downy and can open their eyes, but they require very close parental care. Two osprey eggs hatched overnight on May 25-26th at Forsythe NWR in Oceanville. Posted in Osprey Cam | Comments Off on Twins! Two osprey eggs hatch overnight! Technology has proven to be vital to Conserve Wildlife Foundation’s work protecting rare wildlife species over the years. Our biologists depend greatly on modern technologies to band, track, and share online the journeys of wildlife. Our webcams broadcast the most intimate behaviors of nesting birds and bats across the web. And we seek out ever-evolving communications technologies to spread the word about the inspiring stories of wildlife, from social media and infographs to e-books and Story Maps. These technologies offer newfound abilities to share complex data on multiple levels, while still incorporating the awe-inspiring photography and videos that bring wildlife’s stories to life. Conserve Wildlife Foundation of New Jersey is excited to offer our 2014 Annual Report in a unique format that utilizes one of those technologies – Story Maps. In the past year, we have explored the wonders of American oystercatchers with our first Story Map – and now the annual report allows all of our projects to be highlighted in this interactive format. A screen capture of one of the pages of the CWF 2014 Annual Report Story Map. Visit the multiple pages within this Story Map to learn about Conserve Wildlife Foundation’s many projects and partnerships in 2014, and the imperiled wildlife species in need of our help. Find examples of the innovative and dedicated leadership of our biologists and volunteers. And take an online journey across the state to learn how our projects made a difference in all corners of New Jersey in 2014 – a great year for wildlife in the Garden State! Donations needed to see Osprey Cam nest at night! Help us raise $350 to purchase a new infrared light in the next 7 days. UPDATE – after only 2 hours we’ve raised enough to purchase the new IR!! DARK: With no infrared we will not be able to watch the osprey cam nest at night. You would think it would be easy to replace the unit… Not so much. The Raytek i2 infrared illuminator is currently on back-order from our supplier (we have already had one on order for our new Hawk Cam) and we cannot get an advanced replacement from the manufacturer. Now we need to purchase one from another distributor as soon as possible. With your support we will be able to purchase and install the new illuminator before the osprey pair starts nesting in mid-April. We need to raise a total of $350 to purchase the light. Big or small, your donation will help make sure that the osprey cam streams into the many homes and classrooms 24/7 during the nesting season! Thank you!! In other news, the female returned to the nest yesterday! Posted in Osprey Cam | Comments Off on Donations needed to see Osprey Cam nest at night! Osprey Cam at Edwin B. Forsythe NWR is back online! Thumbs up! Osprey Cam is back online. 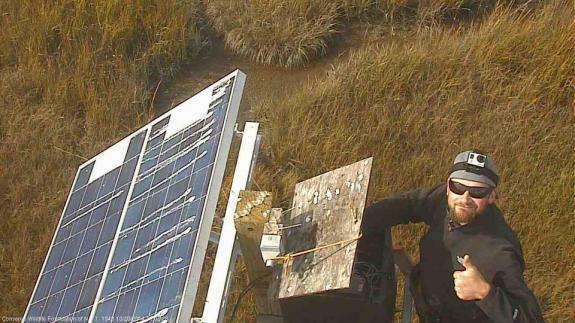 The Osprey Cam inside Edwin B. Forsythe NWR is back online! Yay!! The source of the problem with the camera dying right when the young were ready to fledge, is with the network switch. Apparently it can’t handle the high heat inside the equipment box. Either way it turned off at the worst possible time! This fall/winter we’ll be working on a fix for the problem. We’ll also be looking to enhance the camera experience. Now that the birds are somewhat used to the camera setup, we’re thinking of installing the PTZ camera right off the nest. It’ll give us great close ups of the adults and nestlings! More news to come. For now you can keep an eye our for wintering peregrine falcons, bald eagles and any other birds that might perch on the platform! Posted in Osprey Cam | Comments Off on Osprey Cam = Fixed!